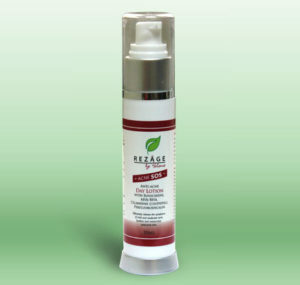 Our Day Lotion is specially designed for all types of irritated, acneic skin and even rosacea. The secret to our formulation is celandine—it is extremely soothing and healing! We’ve also included an SPF of 16 into our formulation to protect you from the sun’s harmful rays—so now, you could skip the step of lathering sunscreen on your face and go straight to enjoying your time outdoors all day long, without that heavy greasy feeling. It offers UV protection and is designed to provide soothing, hydrating, re-texturing, and a moisturizing effect for oily or acnetic skin, without causing shine or breakouts. Protects sensitive oily acnetic skin from harmful effects of UV light. Regulates sebum production, purifies and balances oily acnetic skin and tightens enlarged pores. Apply lotion onto clean face and neck avoiding eye area. Recommended to use in the morning (can be applied under make-up). Stop usage if irritation or rash develops. Keep out of reach of children. Recommended for all-types of Acne problems. Sunscreens: to protect skin from ultraviolet rays.